There’s a credit crunch on, so we’re told, and it’s forcing everyone to be perhaps a little more frugal than they might have otherwise been. So, y’know, it’s OK. Nobody holds it against you that you didn’t just blindly pre-order Left4Dead already, securing early access to the demo. Really, it’s…well, not exactly fine, but certainly forgiveable. 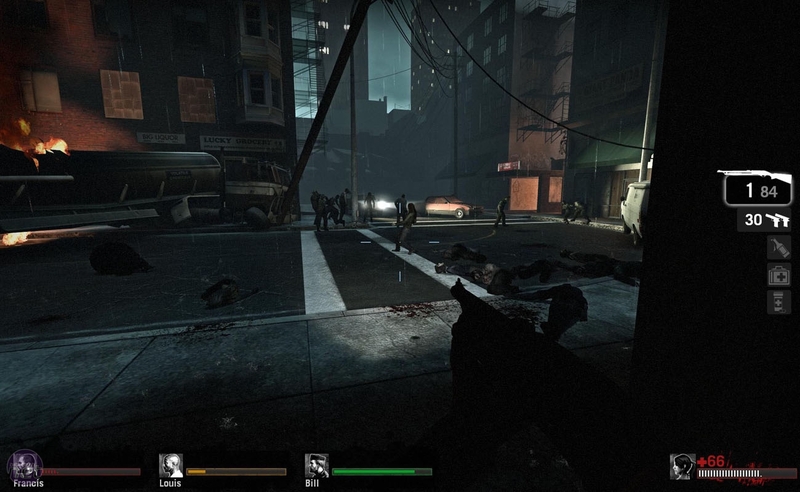 With the early access demo now available, the servers are overflowing with fans of the new co-op zombie shooter from the makers of the Half-Life series, and that means we’ve finally been able to get serious time clocked up with the game without the developers leaning over our shoulders. Thus, here are our impressions for those of you who still have another week or so before the demo becomes truly public – those wily few who insist on trying before buying. Another little taster before the demo goes utterly free on Tuesday, a week before the official launch. The demo itself picks up exactly where the introduction video ends, with the four main characters atop an apartment building in a nameless city. They’ve just heard an emergency broadcast telling them to head for Mercy Hospital where survivors of this 28 Days Later-style outbreak are being evacuated and they’ve chosen to head there through the subways. As plans go, heading into pitchblack tunnels perhaps isn’t the best approach in the case of a zombie apocalypse, but we doubt that these character have put as much planning into it as we (in the office) clearly have. It’s here that the players step in, each one choosing which character they want to be. There’s Zoey, the pistol-wielding girl, Bill the gruff old General, Francis the shotgun-happy biker and Louis…who has the red on him. Unfortunately, there are a few flies in the ointment already and though Valve is reportedly responding to user feedback and improving the server browsing system, the version that’s currently available isn’t great. The Left4Dead server searching system is…unique. Basically, there is no server browser. How it works is that you choose whether you want to play with your Steam friends or just online with other people and then the game will either show you a friends list or matchmake you straight away. The searching system is actually quite good, prioritising dedicated servers and checking based on player abilities, ping and even what territory the players are in. Granted, it’d be nice to put more filters into this and tell the system to only connect you to people who do or don’t have microphones for example, but you can’t have everything. Yet. The main issue with this though is that, if you’re only interested in starting a LAN match then there’s currently no way to stop the game searching for an online, dedicated match – but, again, Valve is supposed to be working on a solution as we speak. The way they test games and listen to gamers is one of the things that have made them such a great developer. 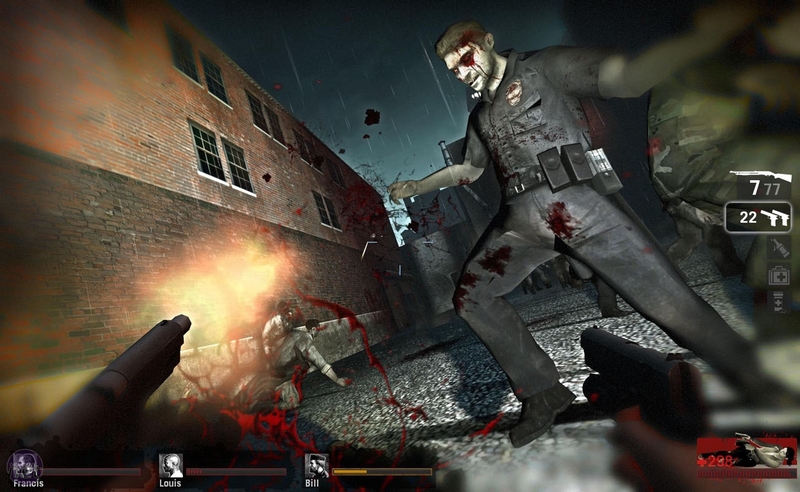 Valve has dated the launch of the new Steam Cloud service, pledging that it will go live with Left4Dead.